Upper Austria welcomes businesses. No ifs and buts. Attractive framework conditions for companies and people ensure that Upper Austria remains the most dynamic economic region in Austria. As a leading export, technology and industry province at the heart of Europe, Upper Austria offers everything companies need to be competitive: first class infrastructure, qualified specialists, innovative environment and the highest quality of life. This is what makes the difference: This is Upper Austria. Upper Austria grows stronger. Relocate here to profit from a dynamic economic environment. The myriad, innovation-promoting mix of different industries and different sized companies simply achieves more. Around a quarter of Austria's industrial production and exports come from Upper Austria. Leading European companies nurture important future markets from here. Simply because it's easier to grow stronger in Upper Austria. Upper Austria is at the heart of Europe and offers the best connections in every respect: by road (with the Westautobahn (A1), the Mühlkreis- (A7), Innkreis- (A8) and Pyhrnautobahn (A9)), by rail, by the Danube (with three Danube harbours) and by air (Blue Danube Airport Linz). The latest broadband infrastructure is being constantly expanded to make sure digital business has the best possible connections to the future. Please find here the actual infrastructure report of Upper Austria. 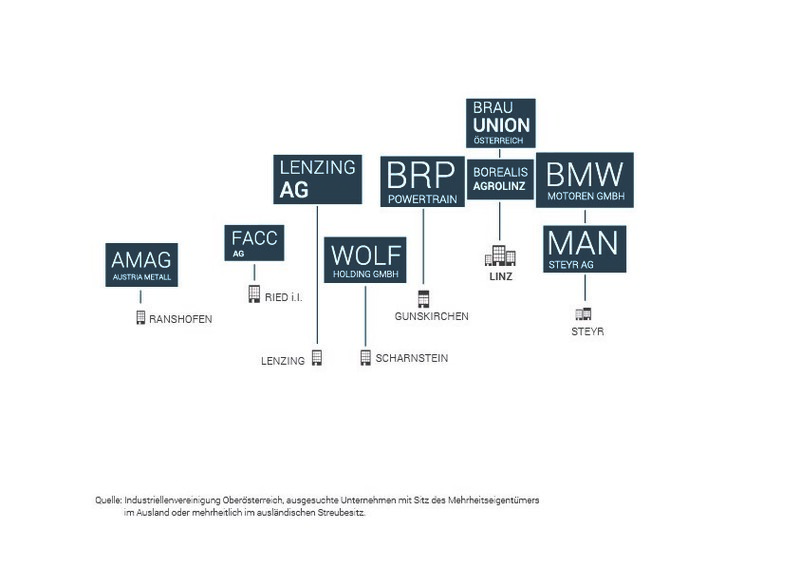 Motivated personnel from Upper Austria possess first-class qualifications and are a decisive success factor for companies located in Upper Austria. These people are supported by a modern, versatile training and education landscape geared to the needs of industry. Upper Austria operates leading apprenticeship programs to ensure companies have the specialists they need. The Johannes Kepler University in Linz provides sound academic training, focussing on technology and the natural sciences. The University of Arts and Industrial Design Linz centres on the interfaces to design and media. Upper Austria's acclaimed universities of applied sciences in Linz, Wels, Steyr and Hagenberg together offer high-profile courses and post graduate training to provide companies with the required expertise. Upper Austria's stable and predictable economic policies provide companies with the best platform for growth and success. You will find more than rhetoric; new ideas, innovative strength and entrepreneurial dedication are actively promoted in Upper Austria. 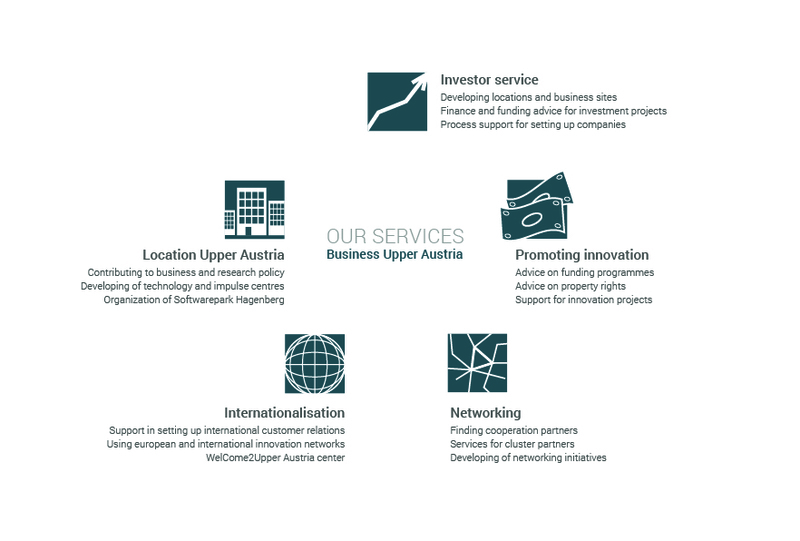 As Upper Austria's economic agency, Business Upper Austria is the innovation motor and key contact for location development, cooperation and advice on funding. As a one-stop-shop and full service provider, Business Upper Austria supports your economic success with tailor-made professional services. Live better in Upper Austria. Breathtaking landscapes and lakes. Unlimited sport and leisure activities for every season. Huge range of art and cultural events with internationally acclaimed festivals on your doorstep. In Upper Austria you can enjoy real quality of life. Something very much appreciated by employees, who can refuel with energy and motivation on-location. In Upper Austria, the great wide open is simply closer than anywhere else.